The official, first of many, shopping trips for the new shop kicked off today. The ever-important storage shelves were procured, ensuring our coffee won't be stored on the floor, a good start indeed. After downloading Google SketchUp I got to work yesterday on designing our to-be counter for the new vessel and Summer and I settled on the tenaciously named wall paint color of "Relentless Olive"; an appropriate beginning! We are getting closer to finalizing a deal on a roaster, a Diedrich IR 3. Our last couple of roaster finds were scooped up by other buyers prior to our pulling of the trigger. Due to this, I have been exercising my trigger finger, and it is getting a lot faster thanks to Gun Club Mojito Cup Challenges. Last night brought another new challenger to the range, but it was Dave (of Alldredge fame) who was the "hot shot" and snatched victory from the wily veterans of Gun Club. Good show Dave, and thanks for bringing the 30-30, a fun gun. It looks as if Monday evenings are a good fit for Gun Club, so if you are so inclined, come by the HypnoVessel, Highland Prospects, or Hellbender Burritos and inquire within. 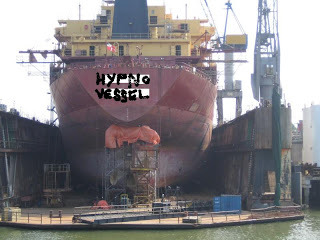 As always I shall keep you abreast of each step as the HypnoVessel prepares to move to new portage. The IR3 TaTa or the IR3 FeMe ? The IR3 Table Top model, in Crimson Red, the color of a coffee bean when it is still a cherry. Thanks for asking.